Tiny and lightweight, this waterproof permanent lighter is an inexpensive, nifty gadget. 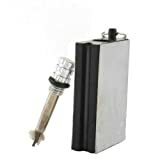 Just add several drops of ordinary lighter fluid, let the wick get wet, gently strike the side of the case with the tip of the wick and get a good steady flame! Lasts a long time with just a bit of lighter fluid.